Entropic Gaming System is a complete RPG published by Mystical Throne Entertainment. 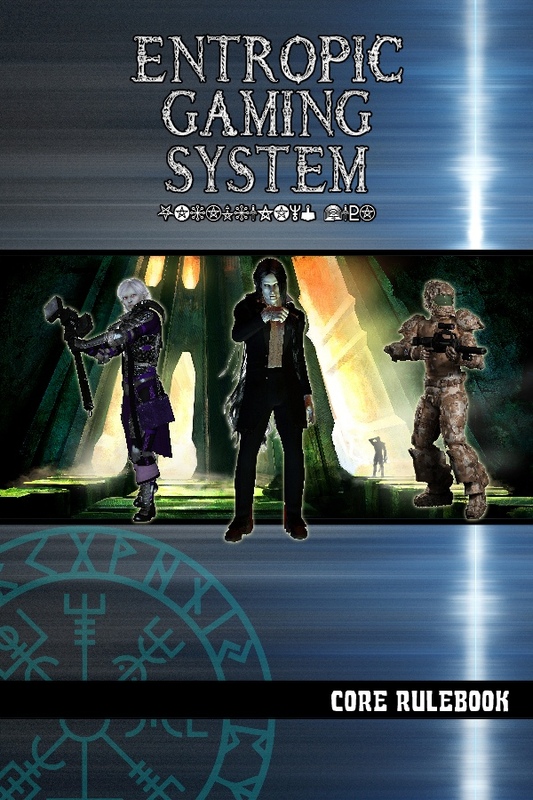 The Entropic Gaming System is designed to put the power of the game’s mechanics into the hands of the character. Instead of the game system defining the capabilities of the character, the character defines the capabilities of the game system. This is done by allowing characters to combine their Abilities and Skills in different ways to perform whatever action they wish and creating in-game bonuses based on a character’s concept. The Entropic Gaming System utilizes an escalting die going from d4 to d12 to represent a character’s main stats. When performing a Skill Roll, the chosen Ability’s die and the chosen Skill’s die are rolled together and summed to meet or exceed the Target Number. The power of defining which Ability and Skill combination to use is based on how the player envisions the character performing that action using the Abilities and Skills he has along with plausibility and some adjutication from the Gamemaster. I have always wanted to find just the right system to create settings for Shadowed Earth. The system would have to be flexible and easily modified to encompass the different time periods, but at the same time I want it to embrace the possible horrific aspects of the setting. At the same time, I want players to have maximum flexibility when creating characters due to the settings being historical fantasy horror where class and class-like systems breakdown. Another big part of designing the Entropic Gaming System was to take a new approach to character bonuses. Static bonuses are often too limiting and players shouldn’t have to continually search through stacks of books to find which static bonuses do what they want and which ones compliment the bonuses they already have. Players should be able to focus on how their character’s develop their Skills instead of worrying about which bonus to take next. Many games have had a large influence on the design of the Entropic Gaming System. Savage Worlds and Legend are the big two, with minor influences from Colonial Gothic, Renaissance, Corporation, Storytelling System, Cortex, Fate, Dark Heresy, and the alternate history requirements for Shadowed Earth. The Entropic Gaming System was handed off to playtesters for a roughly 6-month open beta playtest. Research came in the form of listening to what playtesters had to say regarding the mechanics and analyzing the different characters they created. From there I was able to better understand how other players would approach the system. The art in the core rulebook is meant to be quite basic. The illustrations are a variety of genres, but each one is a rather basic representation of that particular genre. I didn’t want to go overboard with trying to visualize mechanics when there’s no setting involved. That way the focus is on what basic mechanic is being recreated or represented by the illustration instead of trying to determine what setting it most likely represents. The Entropic Gaming System is not for beginners, but it doesn’t require any advanced understanding. Instead, it’s meant for freethinkers that don’t want to be limited by the options available in the mechanics. Just because one character does something this way doesn’t mean another character has to do it the exact same way. This results in truly unique characters that use their strengths to perform great deeds. They’re not required to “take this Skill” according to the rules in order to proceed with their game’s overall storyline. The Entropic Gaming System is unique in that it blends similar mechanics from different systems to create a new experience. The underlying purpose of all mechanics is to provide more outcomes without creating so many options the system becomes bloated with mechanics. This is a real challenge as you have to find a way to blend different forms of mechanical representation so that all mechanics feel cohesive. If an option is dynamic in one place, similar options should be dynamic in every place. If something is static to keep the game moving faster, all similar options should be static to keep that homogenous feel. All of this is done while keeping the system rules-medium. The Entropic Gaming System was in development in some form or another for two years before actual writing began. I had been periodically brainstorming ideas from before the first days of writing Judgment Day, although I just couldn’t seem to find what I wanted. After playing around with new mechanics here and different concepts there, I finally put it down and vowed to come back later. At some point I renewed my excitement for developing EGS and started playing around with a few different types of mechanics. What I realized is my mechanics were not cohesive enough to the point where an option here didn’t actually match a similar option there. That’s what I realized a new approach was required. What I started doing was connecting what I wanted in a character to how I would represent that mecahnically (versus the other way around which I had previously been doing). This is when I finally stumbled upon many of the basic concepts about maximizing flexibility while minimizing the number of options necessary. Qualities being dynamic bonuses was one technique while fine-tuning sorcery from Legend to become an entire magic system was another. The game system really started to develop at this point when I finally realized it was the character driving the mechanics I wanted, not the other way around. I didn’t want every character to feel the same because the mechanics state “you must have x y z in order to do a b c.” When I thought about that, many questions came up in terms of “But I can think of three different ways to do a b c and only one requires x y z.” This is when I turned to other systems that use combinations to create actions rather than single Skills. This also allowed me to keep the Skill list trim while maximizing its use. Once I finally had those flexible, minimalistic baseline mechanics established, the rest just sort of filled in as I went along. My gaming group and I did have some interesting conversations regarding mechanics and I set about finding ways to incorporate that (such as the Heroic Dice Pool), but otherwise most of the remaining parts of the core rulebook came about from connecting the dots between what a character can do and how the mechanics support that.